Funding falls into two categories which are discussed below: funding for online schools and programs, and funding mechanisms used by mainstream districts to pay for digital learning. Although some overlap exists between these two, for simplicity, we have separated them here. Standard state-specific public education funding channels, which include ADA (Average Daily Attendance), ADM (Average Daily Membership), and count days (single or multiple). These mechanisms often fund students in district online and blended schools. Course-level funding, especially funding that follows the student, is relatively new because student choice at the course level is relatively new (except in Minnesota). Course-level funding is a subset of standard state-specific public education funding, with the funding going to the course provider instead of to the student’s enrolling district. 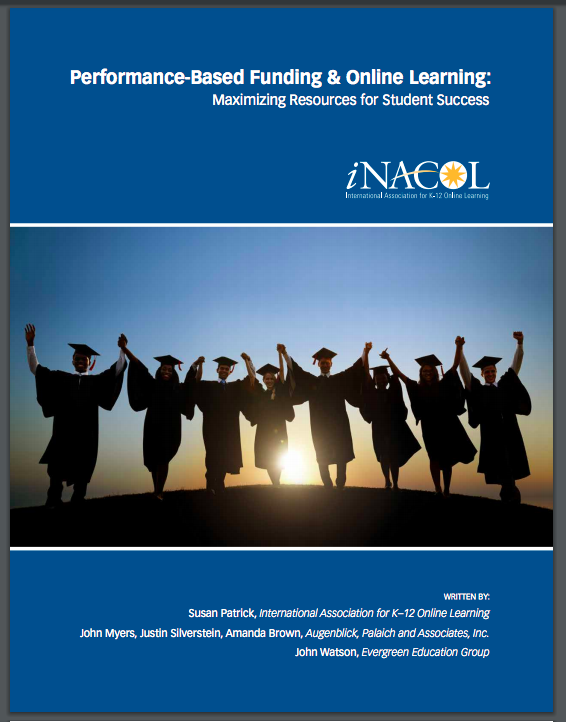 A further subset of funding, most often applied at the course level, is performance-based funding. Several states have begun funding individual online courses partly based on demonstrated student success. In Utah, the provider receives 50% (25% per .5 credit) after the withdrawal period and the remaining 50% upon credit earned. In Louisiana, online course providers receive 50% when the student starts the course and 50% upon the student’s successful completion. In Texas, state funding to the home district for courses taken through the Texas Virtual School Network (TxVSN) is based on a student’s successful completion; in addition, 70% of the payment is given to the TxVSN provider to the student’s home district as long as the student is in the course after the withdrawal period, and the remaining 30% is earned upon the student’s successful completion and credit earned. The examples above are all based on state funding flowing directly to online schools and programs. Another main mechanism by which course providers are funded is via course fees that districts pay for online tools, resources, and teaching. In the case of most companies that are providing these products, the mechanism is standard fee-for-service contracts. However, some public agencies and NGOs serve as online course and services providers also, and these organizations may be funded by a combination of direct appropriations and course fees paid by districts or parents. The Federal Office of Educational Technology website includes a page on funding digital learning, and a letter from January 2017 that details ways in which federal funding sources may be used to purchase technology, including online and blended learning content, resources, and support. When thinking about funding for digital learning, one of the first steps is to complete an inventory to see what is already available and whether or not what is available can be used or repurposed. There is also merit in seeking out partnerships with private and other public entities in order to lighten the financial burden. Many districts have started BYOD (bring your own device) initiatives. Funding can come from federal, state, and local levels. Funding from federal agencies such as the Institute of Education Sciences (IES) as well as the National Science Foundation (NSF) have partnership grants that allow schools and districts to partner with universities and nonprofits to apply for the purchase of devices, but the funding is also aligned to show how the changes based on those purchases have an impact on student learning outcomes and the system as a whole. When looking at state level funding, these funds are usually earmarked for a general concept such as connectivity or device purchases. Other times, the funding is specifically provided for assessment-based enhancements or professional development aligned with digital teaching and learning. Either way, the states typically define what they expect this to look like and allow districts to decide what that looks like in their own context. There are also some grants at the state level that can be pursued. Local level funding can also include grants from legislative offices. Some districts and schools also run micro-funding opportunities where the district provides a grant funding process at the school or classroom level. Some of these districts and schools go to local funding agencies to help make these local grant programs happen. Generally speaking though, supply and equipment allocations are the traditional route for local funding for digital learning.